OLED TVs help LG to record profits | What Hi-Fi? LG Home Entertainment Company reported a 7.4 per cent increase in revenue in Q1 2018, while Samsung’s consumer electronics division numbers slid slightly. LG’s home entertainment division reported sales of KRW 4.12 trillion (£2.8bn) in the first quarter of 2018, with revenue growing 7.4 per cent compared to the same quarter last year. That’s in big part thanks its OLED and Super UHD top-ranging TVs remaining ‘strong’, no doubt. The division’s quarterly operating profit was also its largest ever. While Samsung Electronics’ total Q1 2018 revenue (KRW 60.56 trillion, or roughly £41bn) showed approximately 20 per cent year-on-year growth (mostly down to its rapid growth in device solutions such as memory chipsets, and also IT and Mobile income from the likes of the Galaxy S9 smartphone), its consumer electronics division saw a slight reduction in profits. However, Samsung CE still posted a hefty KRW 9.74 trillion (around £6.6bn) in sales for the quarter. That’s compared to KRW 10.34 trillion (£7bn) in the first quarter of 2017. Samsung put this slight dip down to an adjustment in its TV line-up, where some mid-range to low-end products were removed in favour of larger screen sizes (which is where Samsung appears to be focusing its attention). 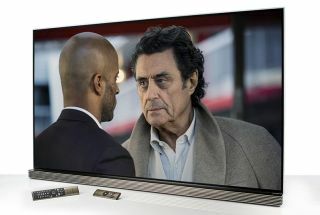 It’s here Samsung claims a high market share in the ‘$2500 and above’ TV segment, thanks to expanded sales of flagship models, including QLED and larger-screen TVs. Its forthcoming 8K and MicroLED models this year will no doubt look to further that preeminence.